Thriveabetes is a diabetes conference for people with type 1, organised by people with type 1. However, as an adult with type 1 diabetes I only attended the presentations that were specific to me. I have more reviews to come but these two presentations really had an impact on me. - How much do you feel responsible for your diabetes? - How much control do you feel you have over your blood glucose? What, in addition to carbohydrates and insulin, affects blood glucose? Yeah, right! The list is endless! So why do we feel 100% responsible for something that is only possible to “control” between 60-70% of the time? There are a variety of answers to this question but an element of this is also that we make ourselves feel responsible. Sometimes we believe that it’s my diabetes and no one else should carry my burden. That feeling of trying to be 100% responsible for something, we can only be in control of between 60-70% can lead to diabetes burnout. 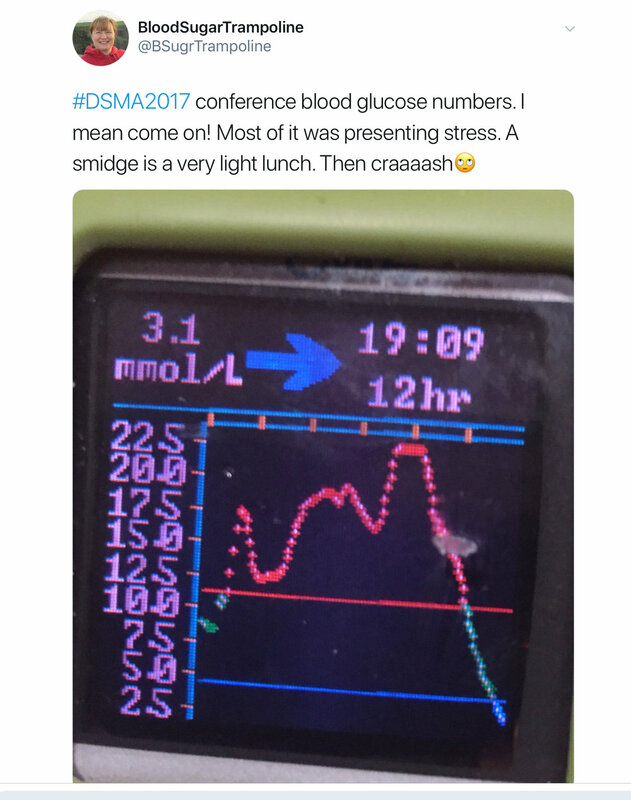 I first saw Mark Davies talk at the international Diabetes Self Management Support Alliance conference in November 2017. I knew straight away it was a talk we had to have at Thriveabetes. His original title was "Learning from Sports Psychology" but I thought it was about exercise, duh! How wrong I was! So what does sports psychology have to do with diabetes? Mark introduced us to aspects of sports psychology that may be useful to apply to preventing or acknowledging diabetes burnout. And this is where Thomas our type 1 former pro cyclist helped out. Thomas told us of his coach in his early cycling career who focused on winning. Mark asked Thomas how many cyclists he knew who had won a race? The answer was none. We’ve all seen the Tour de France where there is just one winner. There are usually 22 teams with 9 riders each which makes 198 competitors. That’s 197 losers. Thomas said by focusing on winning all of the time, he felt awful and he would be so hard on himself after every race. Some sports coaches preach what’s known as the “psychology of winning”. The problem with the psychology of winning is that most athletes loose! If you never “win” then how do you motivate yourself to even try? The alternative sports psychology is to focus on “performance based” psychology which is the process rather than the end goal. As an athlete, you would focus on training, eating well, etc. This ethos comes from American football coach, Bill Walsh, who using this process took a team who always lost to winning its first championship in just two years. “The San Francisco 49ers won its first championship just two years after winning only two games. Under Walsh the team rose from the cellar to the top of the NFL in just two seasons. Process͟ of improvement leads to ͞result͟ of victory and not vice-versa. Focus on processes that produces results and not on results. Promotions/wins/sales quotas (and HbA1c) are results, they do not provide information about performance. It’s important to dig into performance to find truth hidden behind these results. And if we focus on these three things then our goals of reducing our HbA1c and having our glucose levels spend more time in range should improve. The lesson I walked away with from this presentation was focus on doing my daily tasks in diabetes, don’t focus on number on a meter or a HbA1c, use them as information to improve with, and above all don’t beat myself up over the things I can’t control. If I’ve done all I was supposed to do and still get complications how do I cope with that diagnosis?